As the 2016 campaign reaches fever pitch, the more heat there is and the less light is shed. Which is why evolutionary anthropologist Peter Turchin's new book comes as such a breath of fresh air. "Ages of Discord: A Structural-Demographic Analysis of American History" is not about this year's presidential election, per se, but it's a quantum leap forward in illuminating the disintegrative trends that America has experienced over the last several decades that are currently driving our politics. Everything from skyrocketing inequality and political gridlock to white working class angst and the rise of mass shootings and other troubling signs of our times — these are all interconnected reflections of where America is in a cyclic historical process: social integration followed by disintegration, discord and violence. Turchin and others have observed this pattern repeatedly in civilizations from ancient Rome and early Chinese dynasties up to the present day. Historians, and even poets, have long been familiar with cycles of rise and fall, but understanding them has proved more difficult. The ideas of Thomas Malthus — that population growth will exceed growth in agricultural production, leading to mass immiseration -- provide one sort of starting point. But civilizations are more than a big, undifferentiated mass of people. Elites can and do prosper while average citizens’ welfare declines, as happened in Victorian England, in our own Gilded Age and again since the 1970s. Elites have their own population dynamics, and can suffer their own equivalence of immiseration when they outstrip their resource base. Thus, both elites and masses go through similar cycles, which are interconnected, as well as interacting with the structures of the state, where elites contest for power and maintain the strength and well-being of the whole society. Jack Goldberg's 1991 book "Revolution and Rebellion in the Early Modern World" was the first to develop a coherent explanatory model with all the pieces connected, which Turchin has modified slightly in his work. "Ages of Discord" also tests this theory against the example of American history, with special attention to turning points in different trends, which show a remarkable degree of coherence. One table lists 29 proxies representing 15 variables, all but one of which — life expectancy — reversed direction within about a decade of 1970. 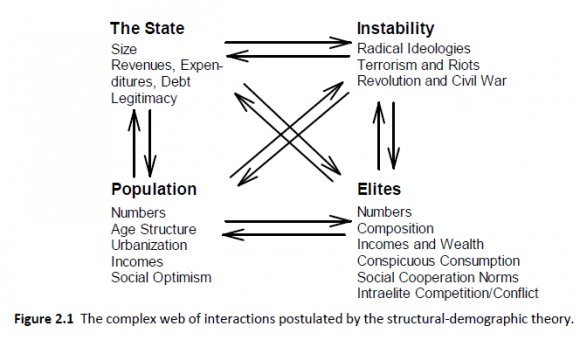 These include three proxies of labor oversupply; two of economic and health well-being; three of social well-being and economic inequality; two of elite overproduction, intra-elite competition and intra-elite cooperation; three of cooperation and equity; and one of intra-elite fragmentation, patriotism, state legitimacy, state capacity and sociopolitical instability. 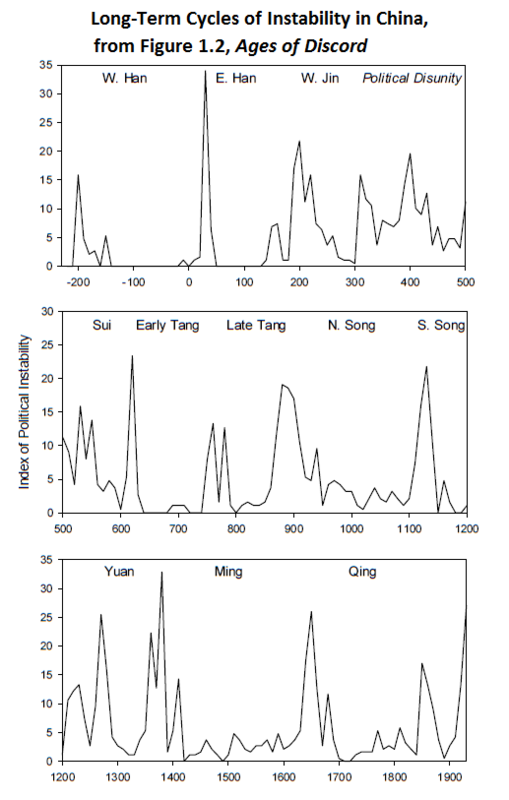 In short, Turchin finds that it wasn't just similar social trends that changed together; trends from every aspect of the model changed direction around the same time. Conservatives have repeatedly blamed liberals for all manner of social ills, such as the decline in the number of children in two‐parent households, which began during that period. But other trend reversals at the same time — top 1 percent income and wealth shares, real minimum wage, labor union coverage, etc., clearly signal shifts in a more conservative direction. What's more, similar broad, interrelated changes have occurred repeatedly throughout history, and the positive trend directions that were reversed around 1970 were set in motion decades earlier, and reinforced by major developments of the New Deal. The halcyon days of the 1950s did not reflect a lengthy lost golden age, Turchin argues. Rather, they were a cyclic echo of the “Era of Good Feelings” around 1820, when social discord was at a low ebb, and there was only one national political party — a period that also quickly gave way to new forms of intense social conflict. The core of the theory in pre-industrial form is that population growth in excess of agricultural productivity gains leads to falling living standards (“popular immiseration”), urban migration, and unrest. It also results in “elite overproduction” — less money for ordinary workers means more for elites, whose numbers grow, producing their own set of problems in the form of intra‐elite competition, rivalry, fragmentation and loss of cohesion. Population growth also leads to growth of the army, state bureaucracy and taxes, pushing it toward fiscal crisis, state bankruptcy and loss of military control, opening the way for elite fragments to rebel and/or mobilize popular resentments to overthrow central authority. Social integration and disintegration alternate in cycles lasting two or three centuries, overlaid with a shorter 50-year cycle roughly corresponding with two generations, reflecting the fact that social unrest tends to spread, burn itself out, and then rekindle during disintegrative phases: 1870, 1920 and 1970 all approximated such peaks in our own history. America's long cycle has been more rapid than most, probably due to faster population growth — there was a full cycle from 1780 to 1930, and an incomplete cycle since, each dealt with in separate sections of the book. But there's surprisingly little difference from the workings of the pre-industrial model. Because Turchin's focus is on the model and how well it accounts for measurable historical changes, the book is not a set of prescriptions for how to get out of our current mess. But the example of how we escaped the last time is surely useful in a general sense. 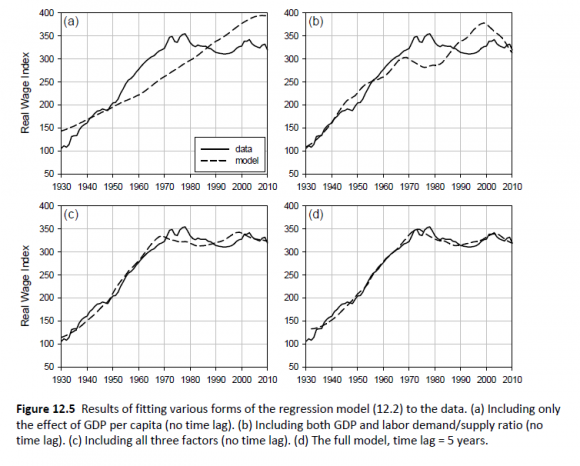 While the New Deal is considered a turning point by many historians and social scientists, Turchin notes, “When we look at major structural‐demographic variables, however, the decade of the 1930s does not appear to be a turning point. Structural‐demographic trends that were established during the Progressive Era continued through the 1930s, although some of them accelerated.” It's that earlier era, therefore, that deserves our attention. And what we find is a surprisingly mixed bag of what we might today call liberal and conservative measures, intended to restrain out-of-control competition and conflicts. On the liberal side of things, society turned against unregulated laissez-faire competition, and toward limited recognition of labor rights. When the Great Depression hit, wages were not cut as a result of this changed outlook, even while unemployment skyrocketed. On the conservative side, there was “the 'closing of the patriciate,' in which the established elites close their ranks to newcomers and dramatically reduce, or even reverse upward social mobility.” Elite entry was restricted both through admissions policies at Harvard, Princeton and Yale (hitting Jews and blacks especially hard) and by reducing the number of medical and dental schools, for example. The elite's turn toward a concern for social harmony meant better treatment for those deemed worthy, at the same time it became more concerned with excluding those seen as not fitting in. This explains both increased exclusion of non-WASPS from the Ivy League and the virtual termination of European immigration, as well as other features of the Progressive Era Turchin doesn't measure, such as the Jim Crow purging of blacks from Southern voter rolls and the growth of the eugenics movement. One obviously doesn't have to approve of every social reform of that period to appreciate the fact that they did help rebuild social trust, eventually reaching levels not seen since the 1820s. This is what science at its best does for a democracy — not tell us what we must do, but clarify the costs, benefits and trade-offs involved, including the tragic costs of doing nothing. "Ages of Discord" is not a how-to book for fixing our fragmented social and political order, but it is an invaluable guide for actually understanding what has gone wrong, and the kinds of things that are needed to set things right. It's a starting point for serious discussion and dialogue, first to absorb that understanding, and then to apply it. That's where things get problematic. In order to gain understanding there's got to be a desire to learn. Examples like global warming — an existential threat not just to America, but to modern civilizations — do not suggest the desire is there, at least not yet. But this election cycle is shaking things up to an extraordinary degree, creating a growing number of strange alliances. There are still many vapid calls and efforts for “bipartisan action” and “consensus,” which fail to take seriously the depth of problems that we face. "Ages of Discord" takes full account of how deep those problems are — they have repeatedly brought about civil wars — and yet it also reflects how, over and over again, social trust and cooperation has been rebuilt, even from the ashes of the most bitter struggles. Now that we know more than ever about this process, we have a rare opportunity for dramatically improving how well we all live together.